Citric acid, or citrate, is an organic acid that exists in all fruits, especially in citrus fruits used to make fruit juices. Fruit juice varies in citric acid content, depending upon the type of fruit and the use of citric acid additives. The U.S. Food and Drug Administration considers citric acid a safe natural acid in the diet. The FDA reports that consuming 500 milligrams of citric acid per day has no harmful effects. Citric acid is the culprit causing your lips to pucker up when taking a bite of a lemon or tasting unsweetened lemon juice. That sour taste comes from the citric acid in the fruit. Citric fruits like lemons, limes, oranges and grapefruit have the highest concentration of citric acid, giving juices made from these fruits their tart, tangy flavor. 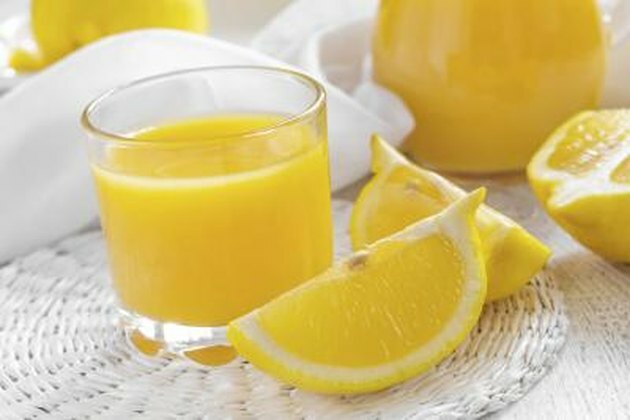 Citric acid added to commercially prepared juice drinks increases the tangy flavor and preserves the color of the juice. The highest concentration of citric acid occurs in lemon juice with 1.44 grams per ounce of juice. Lime juice comes in second with 1.38 grams per ounce, according to Dr. Kristina L. Penniston of the University of Wisconsin School of Medicine. Fresh orange juice or orange juice made from concentrate contains about 0.25 grams of citric acid per ounce. Grapefruit juice contains 0.0068 grams per ounce. The citric acid content of commercially prepared juice drinks varies, depending on the manufacturer, but can range from 0.03 grams per ounce to 0.22 grams per ounce. Some artificially flavored and sweetened juices that actually contain no fruit can have more citric acid than the naturally occurring citrate in citrus fruit. The citric acid in juice has no nutritional value, but it is necessary to your metabolism. According to Reginald H. Garrett and Charles M. Grisham, authors of the book "Biochemistry," citric acid is critical in providing energy to your cells by converting carbohydrates, proteins and fatty acids into water and carbon dioxide. This process is known as the citric acid cycle. When drinking juices that contain citric acid, moderation is the key. Too much citric acid can cause tooth enamel erosion because of its low pH. Lemon and lime juice have a pH of less than 2, which is similar to the corrosive qualities of battery acid, according to an article in "Tufts Dental Medicine" magazine. If you are susceptible to canker sores, drinking too much juice containing citric acid could cause outbreaks. Can Grapefruit or Orange Juice Cause Diarrhea? What Are the Side Effects of Giving Up Soda?